Note that this view’s EXPORT file is different from other views, as it is the only export that includes daily totals for each employee. 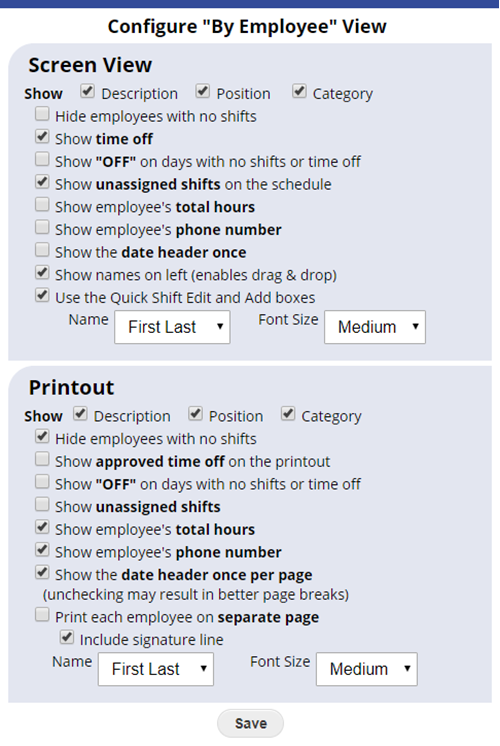 You can move a shift by left click/dragging the shift to another day or employee, or copy a shift by holding down the Ctrl key (Shift on a Mac) and click/drag the shift to another day or employee. 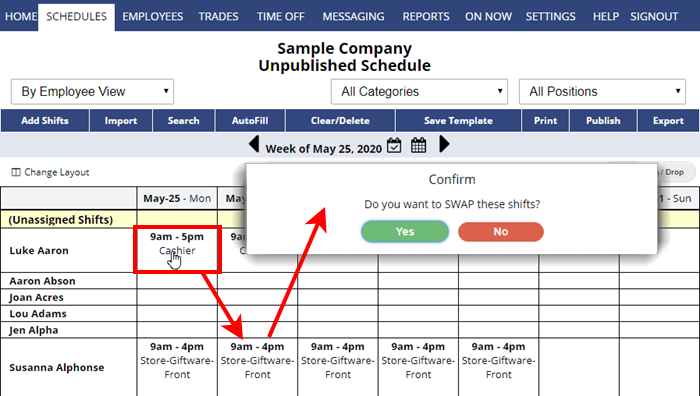 It also allows you to swap two shifts by dragging and dropping one shift on top of the other shift (you will be asked to confirm swap). 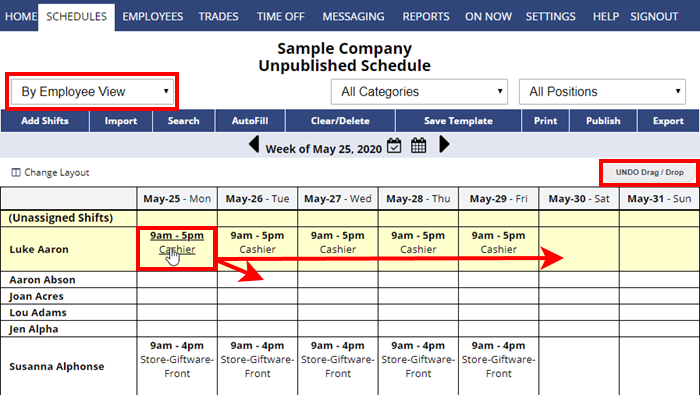 To assign an open shift, drag an Unassigned shift and drop it onto an employee/day cell, or you can Unassign a shift by dragging an employee’s shift and dropping it on the Unassigned row. You can also UNDO changes made with drag and drop. This can really speed up making changes to your schedule. Don’t see the Unassigned Shifts row? Click the “Change Layout” link in the upper left and check off that option. On Published weeks, you can decide whether or not to send email notifications to affected employees after each change using the “Send a notification for each change” checkbox that is defaulted based on your SETTINGS page – check the box to have notifications sent to affected employees who have requested notifications (recommended), or uncheck the box to have no notifications sent. Move mouse to the background of an employee row and day, then “drop” the shift by releasing the mouse (dropping a shift on top of another shift will mean you want to SWAP the shifts instead of just move the shift). Optional – you can first filter the view to only display employees able to work that position. You will see a warning that asks if you want to swap the shifts – click OK. If you want to undo the last drag/drop change you made, simply click on the “UNDO Drag / Drop” button. If you sent out email notifications when you made the change, they will also go out when you Undo the change (and similarly if you did not send notifications on change, then no notifications go out when you Undo). Note that Ctrl dragging shifts to copy them cannot be undone with the UNDO button.